Okay so let me start by saying, excuse the photos in this post - I had to take them with my phone as we were so desperate to eat these!! 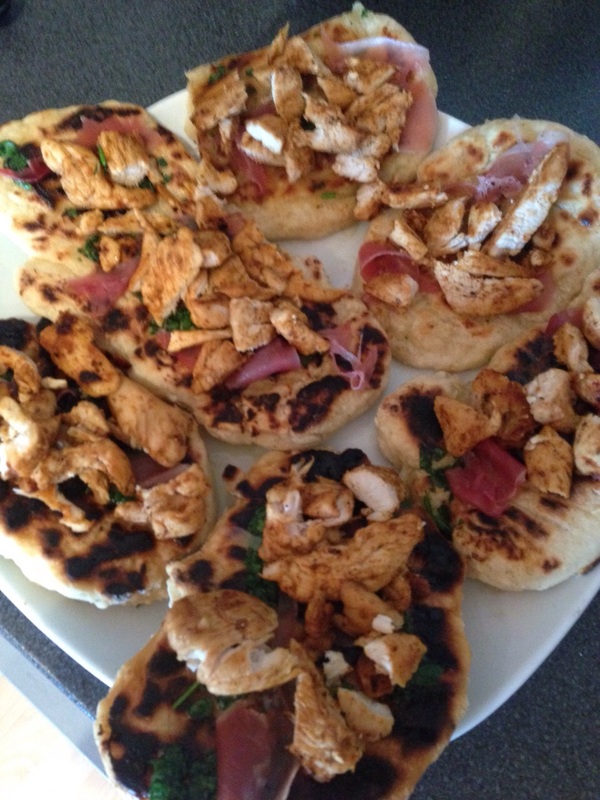 I love flatbread and literally had no idea how easy they are to make. It's an extremely messy process but nonetheless, very easy and even more yummy! I also added spicy chicken and prosciutto ham to make a proper meal of it! 3. Put the dough into a floured-dusted bowl and cover with a plate/foil/clingfilm, then leave aside. 4. If making the garlic butter: peel the garlic cloves and crush them with a garlic crusher. 5. Pick the herb leaves onto a chopping board and finely chop them, discarding the stalks. 6. Melt the butter in a small pan over a medium heat, then stir through the garlic and chopped herbs, then set aside. 7. Dust a clean work surface and rolling pin with flour, then divide the dough in half, then divide each half into 6 equal-sized pieces (roughly the size of a golf ball). 8. With your hands, pat and flatten the dough, then use a rolling pin to roll each piece into 12cm rounds, roughly 2mm to 3mm thick. They puff up a lot so make sure they're quite flat before putting in the pan. 9. Use a knife to cut 6 lines into the centre of each round, leaving about 3cm at each end to get the nice griddle pan look. 10. Place the griddle pan on a high heat, then once hot, cook each one for 1 to 2 minutes on each side, or until bar-marked and puffed up, turning with tongs. 11. Brush the flatbreads all over with herby garlic butter as they come off the griddle. I then added spicy chicken and prosciutto ham and served with a side salad. I feel like I need to make these again just to take photos that can do it justice! Hope you all try it out at home - and take better photos than me! Yum I'm definitely going to try and make these! Try being the right word as I'm a terrible cook but hopefully they'll turn out as yummy as yours look!